If your question isn't listed below, please ask it on the forums. We will answer as soon as possible. Quasar - Intron Theory is a science fiction turn-based strategy game. Inspired by the XCOM series of games in the 1990's, yet created with its own storyline, the game creates it own niche in an area which is currently under exploited in the modern strategy game market. Gameplay has several aspects, the most notable being the "battlescape" and "geoscape" configuration commonly associated with the XCOM series, where the player has a more strategic overview on a global scale with the geoscape, and a tactical view of a single battle in the battlescape. The two aspects of the game play off each other throughout, providing an enjoyable mixture of options. combined with a varied and intricate technology tree, and an immersive storyline, Quasar will prove to be distinct in its genre, with widespread appeal. 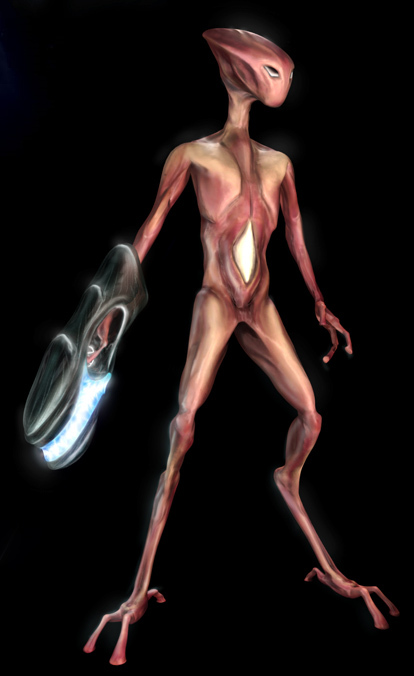 The aim for the player is to repel an alien invasion of unknown origin and strength, which gradually increases in intensity, with a variety of aliens to combat, and a spread of alien craft to engage. The storyline will only be advanced when alien craft are recovered intact, and the extraterrestials defeated in open combat in multiple scenarios, against the odds. The player will have to surmount unfavourable odds, grapple with a foe that is much more advanced than humans, and deploy a range of recovered artifacts into an already unstable situation. Furthermore, they must balance the requirements of a global military presence with a research division and budgetary constraints. Complex principles, yet easy to grasp, Quasar will be a game that truly defines the phrase "easy to learn, yet hard to master". Development of the project will be administrated departmentally, and co-ordinated using the milestone approach. In this way, a member can select a task to complete from a list given by a department leader, and will be assigned a reasonable timeframe to complete that task, usually two weeks. After this time, progress can be analysed, and then the process repeats itself. Additionally, this is how new recruits will be first evaluated, using a similar process to integrate them into their department of choice. We aim to produce the very best work that is possible, however we are not perfectionists in that a measure of common sense will be applied in all tasks. Tasks will largely be generated from brainstorming sessions, and from discussions inside the game engineering department. These discussions may be spontaneous around an area, or they could be directed on a specific aspect of game design. Once there is a list of potential areas, the steering committee will select a path to follow, and department leaders will have a list of tasks that need completing based upon this. Who are Quasar looking for? We are looking for individuals who are willing to dedicate some of their time to this project. Of particular interest are those who demonstrate their ability to think logically, have a creative mind, and are able to work independently as well as in teams. Experience of this area is naturally of benefit, but not necessarily required, yet experience of the area that you would wish to work in is vital. We are interested in people who are willing to look upon the project as more than just a hobby, and have a genuine interest in advancing the project more rapidly towards its short and long term goals, and who would enjoy doing so.